While it’s nice to nestle into your favorite local cafe, sometimes nothing beats a home crafted drink. Personally my faves include a Long Black Americano in the morning capped off with a post dinner Flat White. Time to brush up on crafting your favorite and get brewing! Next Post The Dineen Coffee Co. These grinders are made to handle constant use and have a micro “grind control” adjustment. of the very best. Not only this, but this tank is also detachable for maintainance purposes. 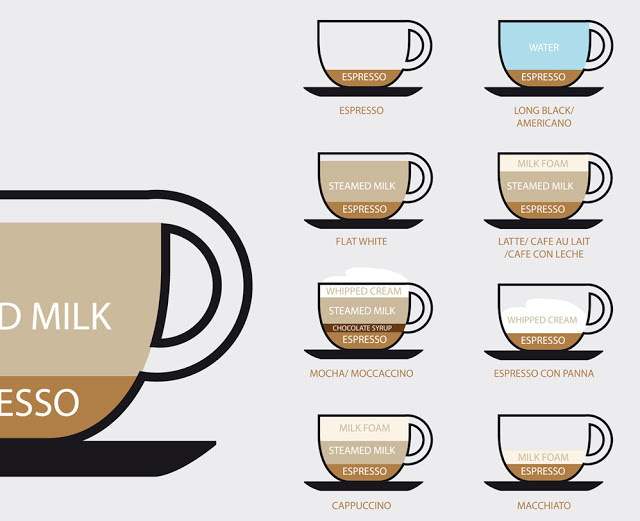 A handy little diagram of a few espresso-based drinks! Thanks Jamey … More to come!